The Starboard 14'x28" All Star Downwind Airline has the free-flowing aramid cable locks the board in shape when inflated, creating a solid trustworthy hull sensation. The patented Airline Technology utilises a pre-set free-floating cable. It is attached to the nose, goes under the bottom and ends at the fin box. The preset cable is slightly shorter than the board so when the board inflates, the cable comes under tension and stiffens the board significantly. This efficient, lightweight technology is the future of inflatable performance boards. The 14'x28" All Star Downwind Airline is the perfect solution for those wanting a downwind race board that’s fast and easy to travel with. 28” width offers extra stability and control in choppy ocean conditions, while the curved rocker with raised nose kick prevents the nose from diving when connecting to bumps. Hook: Cable tension adjustment point with 4 different positions to easily set the wanted tension and stiffness. Nose cone: Guides the cable at the bow’s center line, while creating a perfect nose shape. Made from up-cycled fishing nets. Fin set up: The Airline fin box is locking the cable at the tail of the board, ensuring tighter rigging. The board comes with a toolless FCS connect fin so you can grab the board, slide the fin in and go paddle fast! New race handles: Provide a balanced grip for a running beach starts. New EVA standing tray: Helps to hold wider stance for extra stability and helps recover balance with the EVA to push against. Provides more control to lean on the rail to steer the board from the midpoint. Rail edge technology: Creates a sharp edge for the water to smoothly release for optimal glide and speed. Diamond grooved tail kick pad: Provides grip and control for buoy turning and surfing on the tail. Twin PVC stringers: Positioned on the deck for increased the stiffness. FCS insert: To attach accessories from GoPro to a phone holder. Star Mount is supplied with every board to attach accessories. Bungee tie down: For storing gears and supplies. Lightweight leash: At only 70 gr, the leash is incredibly lightweight and discrete so that it doesn’t interfere when paddling. Soft cushioning means it will compress and flatten when stood on. New bag shape: Is made wider and lower profile so its easy and fast to pack, whilst preserving the shape of the Side Walls. The Deluxe DC technology for inflatable SUP boards of Starboard brings one step closer to a hard board feeling. The Double Chamber stiffens the board significantly, thanks to the double side walls around the second chamber. The second chamber also offers extra safety floatation for any emergencies. 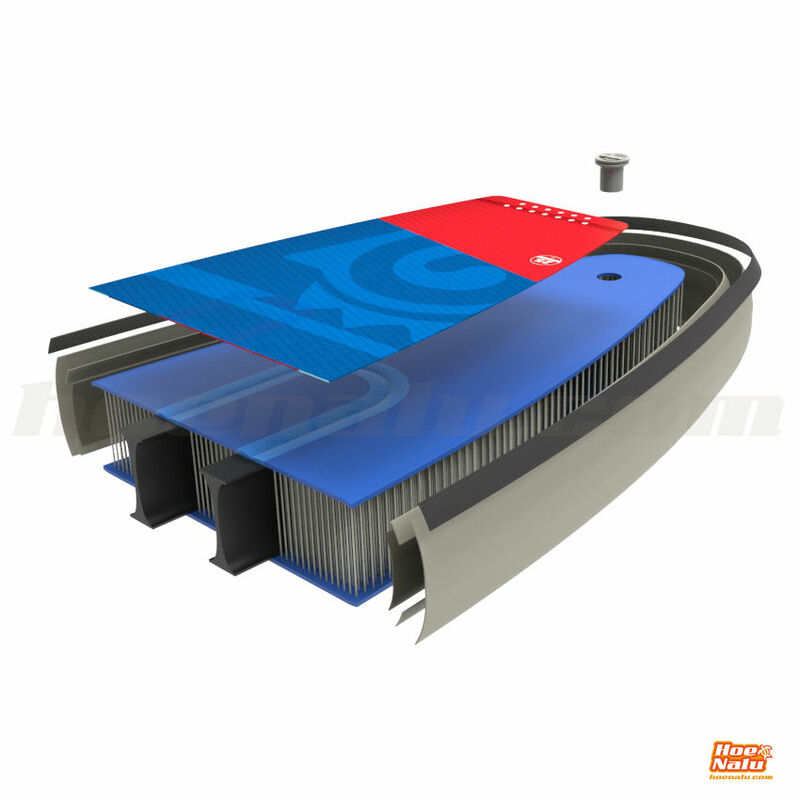 The innovative DC (Double Chamber) the sidewalls and acts like rollable I-BEAMS. Starting just behind the standing area and continuing towards the front, the chamber is placed in the most critical area for flex and reduces deflection by 1.8 cm. The feeling of paddling with the stiff Double I-BEAM stringer is getting very similar to a hard board, propelling inflatable technology one step closer to a “hard board” feel. A must have for riders over 85 kg. Innovation & QualityStarboard: Teamwork in constant movement.